How to start apache cassandra in eclipse? 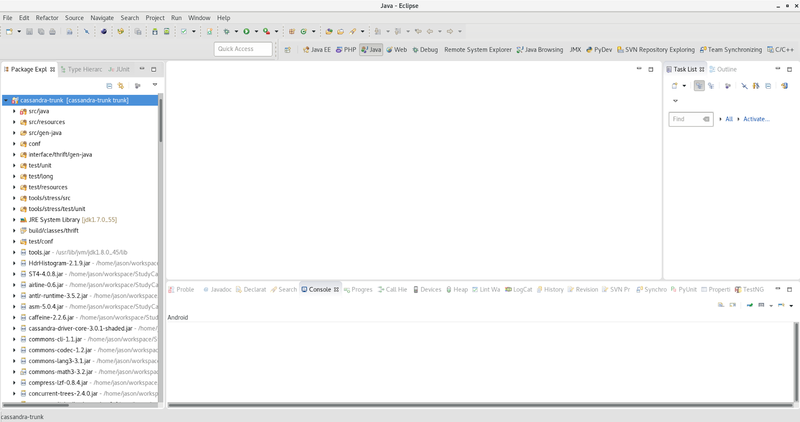 This quick tutorial served as a guidance on how to start cassandra in eclipse. 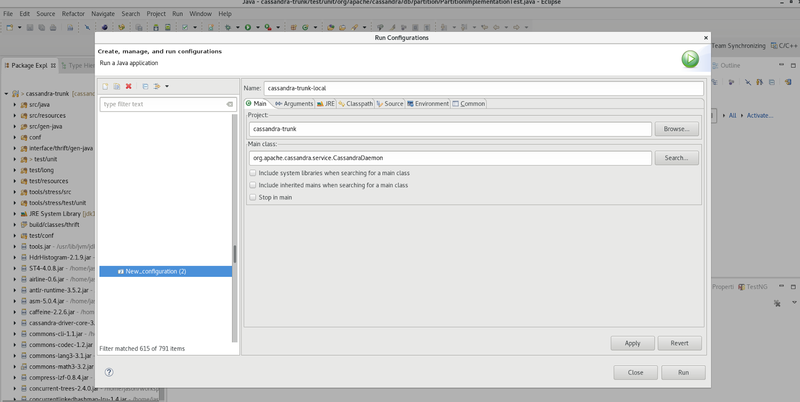 It has assumption that you had git clone apache cassandra and then setup in eclipse. Click on the 'Arguments' tab , and the provide the arguments to start cassandra. click on Apply and then Run button! Check the 'Progress' window and see cassandra is starting. Last but not least, when you are done, remember to terminate the jvm. For the past several years, apache cassandra has always been in my working realm. From start of cassandra 0.8 until cassandra 1.2 to beyond cassandra 3.9 (as of this time), I have been using it by modelling data in cassandra, inserting, retrieving, administrating and maintenance of production cluster. So to take a step further, I thought of going into cassandra development. In this article, I will describe how I got source from cassandra official git repository and setup my own repository in github , so to coexist both of them. First, let's remove the remote origin and then add my repository in github. Of cause, create an empty repository in github first before you continue following. Now, let's check the remote origin. okay, everything is on track and expected. Now let's add upstream to the cassandra git repository. and then we check again. OK! everything is good to go. okay.. now that we have two remote repositories, so how should we continue to work further? Now, when we pull, we have to first specify where to pull from and what branch to pull. In the following example, we pull from upstream on the trunk (master) branch. beautiful, now we can pull from upstream and into our working repository. Let's push our repository into github now. Compressing objects: 100% (42703/42703), done. Writing objects: 100% (266270/266270), 136.16 MiB | 547.00 KiB/s, done. remote: Resolving deltas: 100% (160130/160130), done. Branch trunk set up to track remote branch trunk from origin. okay, that's it, one more step ahead. This tutorial is written such a way you install cassandra using debian package and want to debug remote apache cassandra instance with another workstation with eclipse install. With that said, let's start. * uncomment the following lines in this cassandra environment file /etc/cassandra/cassandra-env.sh . The cassandra environment for debian is located at the path specified. 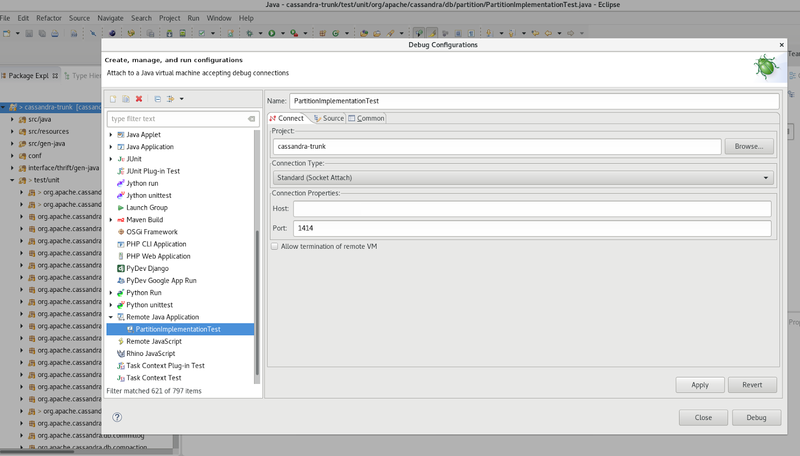 * restart apache cassandra instance and verify the above jvm options are shown in ps output. * okay looks good, now let's move on to the eclipse. See the screenshot below, connect to it. To get to the debu configuration window, click on 'Run' in the menu, 'Debug Configurations...' on the pop up window, right click 'Remote Java Application' and click new. * check in the machine that run cassandra instance. That's it! When you are done, remember to terminate the debug process. To go into cassandra development has always been part of my wish during spare time but due to hectic work and life, this wish never really get kick off.... Until now. I found a very fine documentation and just start immediately once the spare time is available. In this article, I will describe my journey on developing in cassandra. Let's clone the cassandra repository using git. Wait a while on my slow line at 436KBps with 136MB. remote: Counting objects: 273406, done. remote: Compressing objects: 100% (45601/45601), done. Receiving objects: 100% (273406/273406), 136.60 MiB | 436.00 KiB/s, done. Resolving deltas: 100% (164011/164011), done. Once repository was cloned, let's check out the directory. Before we go further, let's checkout the package required by cassandra. So I'm using trunk cassandra , ant version 1.9.7 and oracle jdk version8 update 45. Eclipse I'm a bit behind, I'm still sticking with eclipse luna, I should upgrade to eclipse neon soon! Okay, our tools are all checked at this point, let's start ant build. [javac] Note: /home/user/cassandra-trunk/interface/thrift/gen-java/org/apache/cassandra/thrift/Cassandra.java uses or overrides a deprecated API. Wow, build is success! Next launch your eclipse and create cassandra eclipse development descriptors. 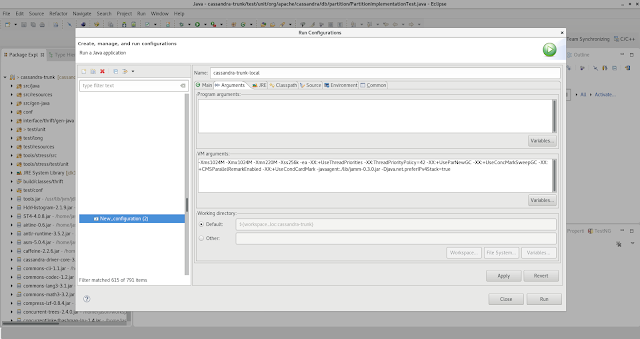 Everything is good and assuming eclipse is also started, now let's import the eclipse settings. Using this sequence,'File' -> 'Import...' -> 'Existing Projects into Workspace'. Click, next and in the 'Select root directory:' textbox , browse to the git repository cloned earlier and select it. Leave the remaining as is and click Finish. If you get error, fix it :D for me, the default java configured for eclipse is 7 and hence, code compile is java 7, so I have to change that and move java lib to the top of the project. Particulary you can move to java lib in 'Order and Export' in project's properties. There are two class file which give compile errors, which I have to commented out the code. since both classes are unit test, I don't actually bothered. Okay, we take a pause here, in the next article, I will explain testing in cassandra. Stay tune! So I continue where I left off and explore further on the pycuda library. This is a good tutorial to explain further what the code does. You can read it more here . 0 upgraded, 2 newly installed, 0 to remove and 508 not upgraded. Need to get 249 kB of archives. After this operation, 962 kB of additional disk space will be used. Selecting previously unselected package python3-py. Selecting previously unselected package python3-pytest. First run is very slow, I have no idea why. Then I run tests again. tests average at 8.5seconds, pretty good. Then I add some code to print the time of the cpu and gpu, looks to me the maths test, cpu perform much better. name="<class 'numpy.float32'>" cpu time="0.00000230599835049360990524291992187500000000000000" gpu time="0.00008139800047501921653747558593750000000000000000"
name="<class 'numpy.float64'>" cpu time="0.00000265298876911401748657226562500000000000000000" gpu time="0.00008218799484893679618835449218750000000000000000"
name="<class 'numpy.float32'>" cpu time="0.00000343500869348645210266113281250000000000000000" gpu time="0.00007703299343120306730270385742187500000000000000"
name="<class 'numpy.float64'>" cpu time="0.00000536799780093133449554443359375000000000000000" gpu time="0.00008030000026337802410125732421875000000000000000"
name="<class 'numpy.float32'>" cpu time="0.00001179199898615479469299316406250000000000000000" gpu time="0.00007762899622321128845214843750000000000000000000"
name="<class 'numpy.float64'>" cpu time="0.00002014498750213533639907836914062500000000000000" gpu time="0.00010288099292665719985961914062500000000000000000"
name="<class 'numpy.float32'>" cpu time="0.00001173198688775300979614257812500000000000000000" gpu time="0.00007860400364734232425689697265625000000000000000"
name="<class 'numpy.float64'>" cpu time="0.00001884899393189698457717895507812500000000000000" gpu time="0.00007704700692556798458099365234375000000000000000"
name="<class 'numpy.float32'>" cpu time="0.00007372199615929275751113891601562500000000000000" gpu time="0.00008238101145252585411071777343750000000000000000"
name="<class 'numpy.float64'>" cpu time="0.00014613500388804823160171508789062500000000000000" gpu time="0.00016600399976596236228942871093750000000000000000"
Have fun and you can get the code from my repository. With last blog which I fail to get a sample working, today I thought of giving pycuda a try. So what is pycuda? PyCUDA gives you easy, Pythonic access to Nvidia‘s CUDA parallel computation API. With that said, I'm gonna give the sample code a try. Let's install python3 pycuda module. 0 upgraded, 10 newly installed, 0 to remove and 508 not upgraded. Need to get 7,150 kB of archives. After this operation, 47.8 MB of additional disk space will be used. Selecting previously unselected package fonts-mathjax. Selecting previously unselected package libboost-python1.61.0. Selecting previously unselected package libboost-system1.61.0:amd64. Selecting previously unselected package libboost-thread1.61.0:amd64. Selecting previously unselected package libjs-mathjax. Selecting previously unselected package python-pycuda-doc. Selecting previously unselected package python3-appdirs. Selecting previously unselected package python3-decorator. Selecting previously unselected package python3-pytools. Selecting previously unselected package python3-pycuda. ah craps, you would think that something is wrong with the lib. It's just that the library did not detect a gpu that is cuda capable. For your information, I have workstation that has two gpu, an intel and nvidia gpu, so it is currently running intel which is not power consumption intensive and I have to explicitly enable nvidia gpu should I need to. With that said, let's try it again. 0. 0. 0. 0. 0. 0. 0. 0. 0. 0. 0. 0. 0. 0. 0. 0. 0. 0.
optirun is a command to enable nvidia discreet gpu on debian. So now import library and it works! Brilliant. By the way, I'm using nvidia 960M gpu. That's it for today. Many articles recently showing using gpu to do arithmetic operation and with so many chips on a gpu in comparison with cpu, I thought it is worth while to spend sometime to look into gpu capabilities. Today I'm trying out gpu sort with gpusortlib. nvcc compiler not install, so let's install it. Note that, this required 668MB of disk space! 15 upgraded, 41 newly installed, 0 to remove and 510 not upgraded. Need to get 668 MB of archives. After this operation, 1,329 MB of additional disk space will be used. Selecting previously unselected package libnvidia-compiler:amd64. Selecting previously unselected package libva-x11-1:i386. Selecting previously unselected package libvdpau-dev:amd64. Selecting previously unselected package libvdpau-va-gl1:i386. Selecting previously unselected package mesa-vdpau-drivers:i386. Selecting previously unselected package nvidia-opencl-common. Selecting previously unselected package nvidia-opencl-icd:amd64. Selecting previously unselected package vdpau-driver-all:i386. Selecting previously unselected package libcublas7.5:amd64. Selecting previously unselected package libcudart7.5:amd64. Selecting previously unselected package libcufft7.5:amd64. Selecting previously unselected package libcufftw7.5:amd64. Selecting previously unselected package libcuinj64-7.5:amd64. Selecting previously unselected package libcurand7.5:amd64. Selecting previously unselected package libcusolver7.5:amd64. Selecting previously unselected package libcusparse7.5:amd64. Selecting previously unselected package libnppc7.5:amd64. Selecting previously unselected package libnppi7.5:amd64. Selecting previously unselected package libnpps7.5:amd64. Selecting previously unselected package libnvblas7.5:amd64. Selecting previously unselected package libnvrtc7.5:amd64. Selecting previously unselected package libnvtoolsext1:amd64. Selecting previously unselected package libnvvm3:amd64. Selecting previously unselected package libthrust-dev. Selecting previously unselected package nvidia-cuda-dev. Selecting previously unselected package nvidia-cuda-doc. Selecting previously unselected package nvidia-cuda-gdb. Selecting previously unselected package nvidia-profiler. Selecting previously unselected package opencl-headers. Selecting previously unselected package nvidia-opencl-dev:amd64. Selecting previously unselected package nvidia-cuda-toolkit. Selecting previously unselected package nvidia-visual-profiler. Let's run the make command again. 0 upgraded, 1 newly installed, 0 to remove and 510 not upgraded. Need to get 689 kB of archives. After this operation, 2,041 kB of additional disk space will be used. 0 upgraded, 5 newly installed, 0 to remove and 510 not upgraded. Need to get 826 kB of archives. After this operation, 2,941 kB of additional disk space will be used. Selecting previously unselected package freeglut3:amd64. Selecting previously unselected package freeglut3-dev:amd64. so finally got it compile and run fine.... but looks like there is no input sample file available! If you got beyond this point, leave your comment below and I would like to run on my workstation gpu too! I have upload source code and compile code here.